Brussels sprouts belong to the cabbage family, and they look like miniature cabbages. These leafy green vegetables are rich in Vitamin C and Vitamin K. During the brussels sprouts season, I buy them regularly and try to include in our everyday cooking. I have already shared roasted brussels sprouts and brussels sprouts paratha. Now it’s time for the Kootu. 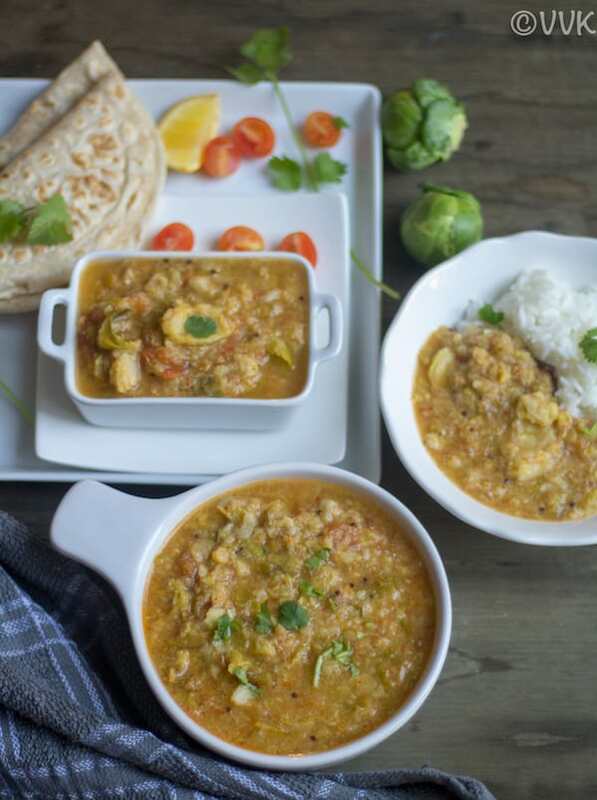 I made this kootu as a one-pot dish with my Instant Pot, unlike the chow-chow kootu where I went with the PIP method. 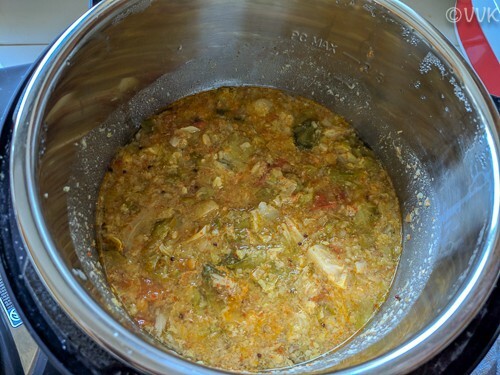 I prepared the masala, tempered and dumped everything in the pot and within 15 minutes, the kootu was ready. I know I made this kootu without any onion and garlic, but you can always include both. I can assure you one thing; even without onion and garlic, this kootu tastes heavenly. It is a perfect recipe for Thursdays or any auspicious vrat days. 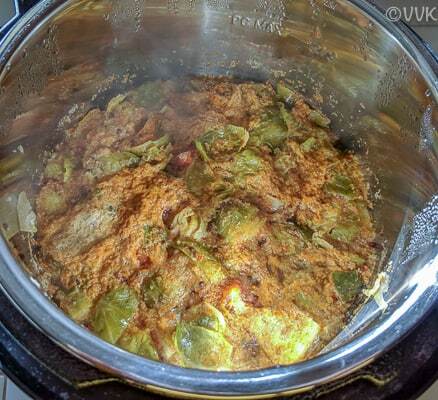 Now without any further ado, here is how I made the brussels sprouts masala kootu in my Instant Pot. Clean the brussels sprouts. Remove the loose leaves and chop them roughly. Chop the tomatoes and wash the moong dal. Grind the coconut, cumin seeds, red chilies, and cardamom into a smooth paste by adding 3 to 4 tbsps of water. Set the Instant Pot in sauté mode and when the display shows “HOT” add the oil. 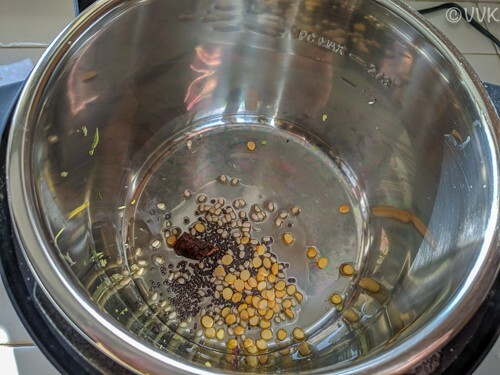 After 30 seconds, add the mustard seeds, urad dal, channa dal, and cinnamon stick. 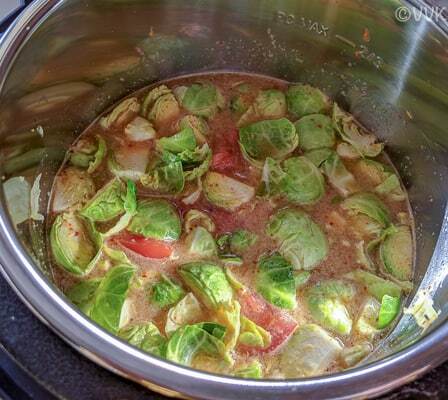 Sauté for 30 seconds and then add the chopped brussels sprouts, ground masala, diced tomatoes, and moong dal. Add salt, turmeric powder, and the water. Press the cancel button and close the Instant Pot. Make sure the vent is in the sealing position. Now press the manual/pressure cook button and set the time to 4 minutes. When the Instant Pot beeps, wait for five minutes and release the pressure quickly after five minutes. Add the cilantro and gently mix. 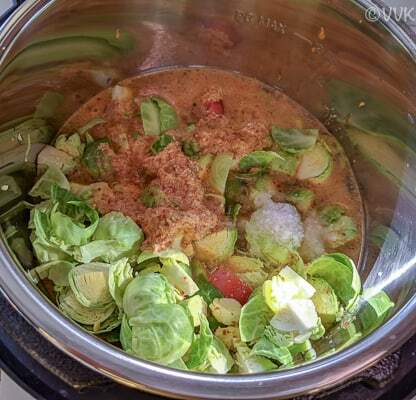 Instead of brussels sprouts, you can add any veggies of your choice. Also, you can make the ground paste without coconut. 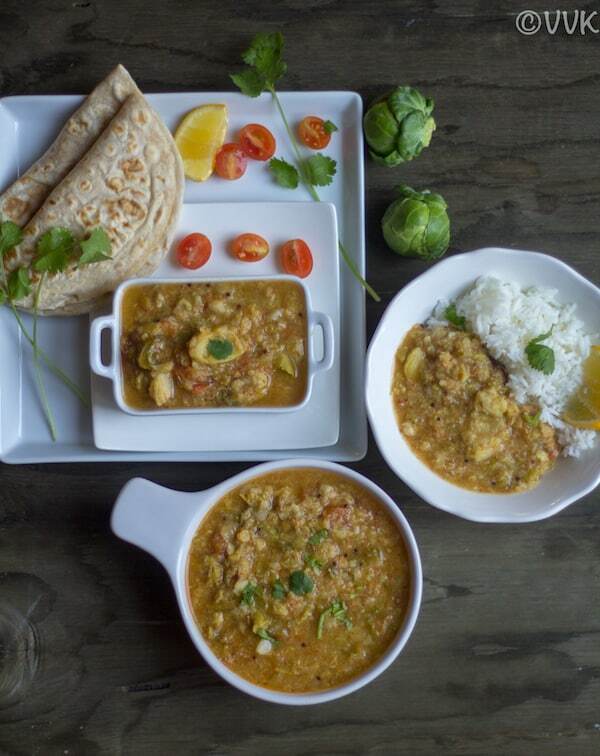 You can follow the chow-chow kootu recipe for the no coconut masala. 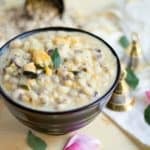 A traditional no onion no garlic kootu recipe made in Instant Pot with the hint of cinnamon and cardamom and of course with fresh ground coconut-cumin paste. Set the Instant Pot in sauté mode and when the display shows "HOT" add the oil. Add salt, turmeric powder, and the water. Mix it all. Also, you can make the ground paste without coconut. 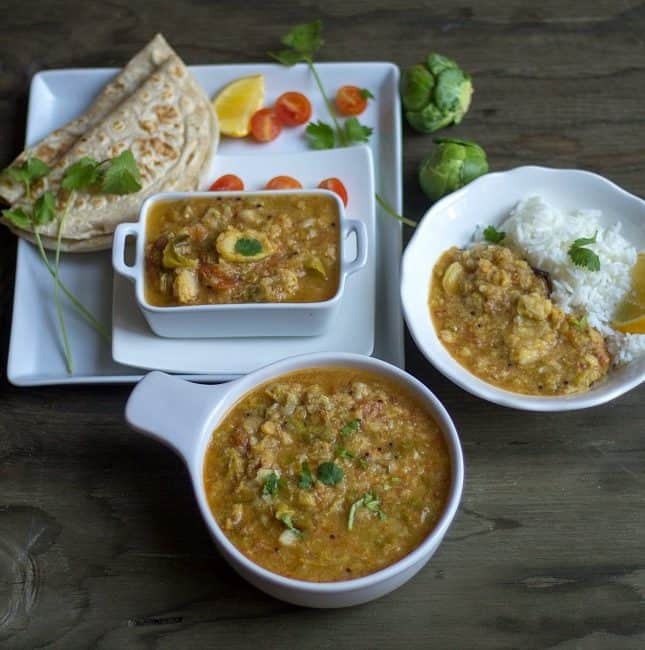 You can follow the chow-chow kootu recipe for the no coconut masala. 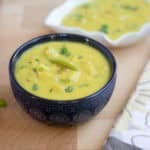 you are rocking with your kootu recipes vidhya and also making me hungry with them! This brussel sprouts kootu looks very tempting, all i need is suda suda saadam!!! Scrumptious! Thanks much, Priya. Glad you liked it. I agree rice and kootu is the best combo. 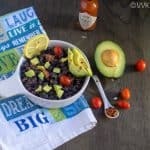 I loved this Brussel sprouts recipe when u shared in the group. surely be aromatic and so flavourful. 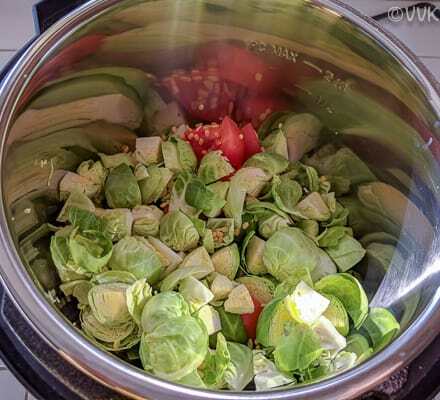 I love brussel sprouts (especially roasted :-) Your kootu recipe sounds excellent. Will definitely try it out the next time I buy brussel sprouts. 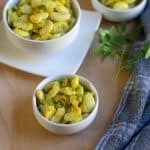 Never thought of adding brussels sprouts in kootu but it looks fabulous. I usually make a stir fry with these tiny cute veggies. The addition of cardamom and cinnamon must give it some amazing flavour. 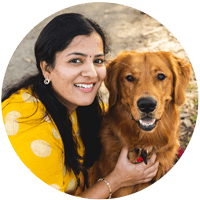 Thanks, Gayathri. Wherever you use cabbage, you can replace it with Brussels Sprouts. I have seen so many recipes of Brussel sprouts baked or in salads. 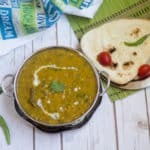 With dal it looks so inviting, will love to try someday. 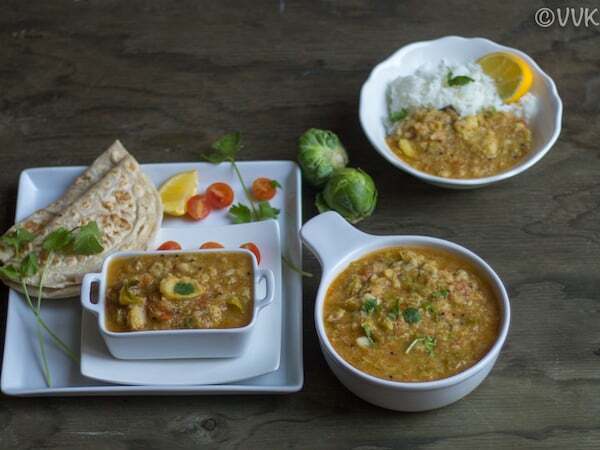 A great way to incorporate Brussels Sprouts in your diet along with dal. Complete meal. Sounds very flavorful. Love the white props there! My kids love brussel sprouts and yet another way to serve them. 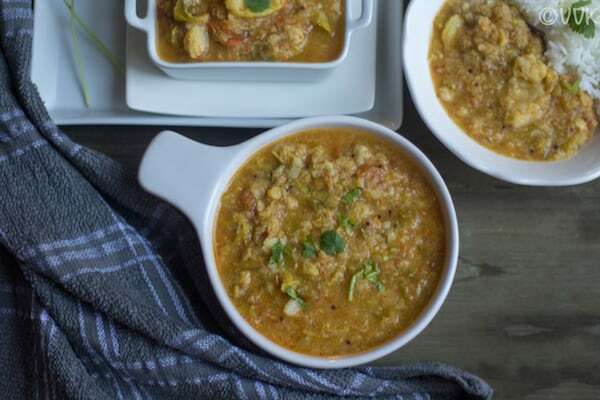 All the kootu recipes you posted this week sound delicious, flavorful and were with variations. Loved them. Extremely too good, what a fabulous kootu, nice way to add brussel sprouts in our diet this way. Kootu sounds an interesting and delicious as well.